Perfect for sketching, drawing, Manga and more, this pen offers smooth, pigmented, archival ink and a tungsten carbide roller tip that guarantees a consistent line from the first to the last drop of ink. The ink is lightfast, bleed-proof, waterproof and fade resistant. 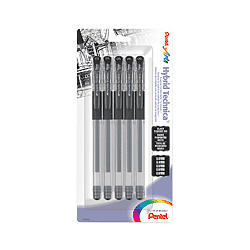 The 5-pen set includes one each of .3mm, .4mm, .5mm, .6mm and .8mm pens.